Python has historically utilised a requirements.txt file for defining the dependencies required of your program, but there are various annoying complications that go along with the traditional model of handling dependencies which has meant we have a few new players in the field to help us. I’ll be showing you the last tool in the list: Pipenv. Although another alternative approach to the specific problem of virtual environments is to utilise docker containers for doing your development, but you’ll need to be comfortable using a terminal editor like Vim (unless you want to jump through some X11 hoops). Using containers also doesn’t eliminate the other issues with determining the right dependencies, so keep reading anyway. Note: if using Docker with a terminal editor like Vim to solve this problem sounds like a good approach for you, then review an older post of mine that explains how to do that. Note: you’ll need Homebrew to install the pyenv command (a sub dependency) using brew, and macOS should have Python 2.7.x installed by default so you should have the pip command available already. 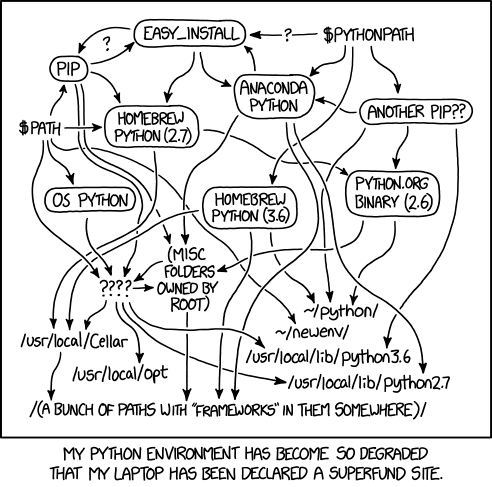 Note: use pyenv install --list to find out what Python versions are available to install. Note: use the shell subcommand to have your current terminal permanently use the chosen Python version (e.g. python ./app.py will work as if the current Python version is what you’ve defined), otherwise use the run subcommand to execute the given command (e.g. python ./app.py) within the chosen Python version temporarily. Now none of these new tools are perfect, and if you want a good run down of one engineer’s perspective on them, read here. In Python 3.5 we get ‘type hints’ which are a way of annotating Python code with type information in a bid to allow for external tools to provide safety similar to what you might see with a statically typed language. Python actually ignores these annotations so type hints won’t break your code if you specify one expected type but provide a different one at runtime. So we can see that the code is stating we expect our foo function to receive a parameter of type integer but when the function is called it’s actually passed a string. You’ll find this incorrect argument type isn’t going to break your program. Our example code also expects a string to be returned by the foo function, but we return an integer value. So this also doesn’t break our program. If you did nothing else at this point, your code would at the very least be very descriptive of the expectations for its use, but what these type hints afford us is the ability to use external tools for handling static analysis. The most popular tool currently is called ‘mypy’. You can run mypy via the command line, and it also provides integrated support for most code editors. This means you can catch yourself breaking the expectations of your program when writing/editing code. I intend to use type hints a lot more in 2019 to help me both identify potential issues in my code during development, as well as being a means of code clarity as to what input/output types are expected. For more examples of using the typing module, please refer to either the official documentation or this useful tutsplus.com article. We’ll cover both of these in the following sections, along with Python’s own ‘protocols’ and ‘abstract base classes’. In summary: an interface is a contract that defines ‘behaviour’, but has no implementation. An abstract class is an actual class that can define common behaviour (including its implementation) along with abstract methods that have no implementation. The implementation of the abstract methods will be defined by the subclass. An interface is useful for when you don’t necessarily care for a specific concrete implementation of some functionality and will happily accept any object as long as it abides by the behavioural contract your receiver requires. For the specific use case of interfaces Python has traditionally relied on ‘duck typing’, which is where a caller provides an object and the receiver will attempt to call the appropriate method on the object (thus trusting the object has a corresponding method available). Note: this is where the term duck typing comes from “If it walks like a duck and it quacks like a duck, then it must be a duck”. If the provided object has the expected method exposed, then we presume it’s of a suitable type. In some cases, such as a reusable shared library, it might be preferable to write code defensibly. Meaning you verify the provided object has the interface the receiver is expecting. This is demonstrated in the following example which expects a client object to be provided, and that object needs to be a HTTP client and so must have both a get and a post method. """Make asynchronous requests via given http client.""" """Ensure http client has supported interface.""" Python not being a statically typed language means it has no support for traditional ‘interfaces’ but the above example ‘defensive’ code is a way to manually mimic it at runtime (as we have no means to validate this at any other time as there is no compilation step with Python, being it’s a dynamic language). Python provides ‘protocols’ as part of their ‘collections’ module and are homed alongside their ‘abstract base classes’ (which we’ll also look at shortly). Protocols are similar in spirit to interfaces in other languages, but in practice act more like guidelines. If one of your custom defined objects implements specific ‘magic’ methods (e.g. __len__, __del__ etc), then you’ll find a selection of builtin Python functions become available to use on those objects that otherwise those builtin functions wouldn’t necessarily support. For example, if we implement the __len__ magic method, then our object will be able to utilise the builtin len function. Also, once we have protocols in place we can use mypy along with type hinting to implement a development time interface check. Notice that in the above example we state that the first argument to print_size should be a type of the typing.Sized, which is actually a mapping to the collections.abc.Sized protocol. Note: the first argument to typing.NewType needs to match the name of the variable it is assigned to. Also, when we create an instance of CustomProtocol the underlying ‘type’ is Team. Note: the argument type passed to print_size is CustomProtocol which doesn’t make mypy complain because the underlying type for CustomProtocol is actually the Team class, and the underlying Team class is supporting the typing.Sized interface (which maps to the collections.abc.Sized protocol). If you want more information on mypy’s support of protocols, I suggest reading their specific documentation here. An abstract class allows you to define common behaviour as well as ‘abstract methods’ that have no implementation, in which the subclass will be required to provide the implementation. Note: in other languages that support proper abstract classes, you would not be able to instantiate the abstract class directly (like we have done in our example). To make the above example code work correctly we need our class Thing to actually implement the exepected behaviour (i.e. a bar method). If Thing doesn’t provide the expected behaviour then we can’t instantiate a subclass of Foo. This also means that if we’re using a static analysis tool such as mypy, we could have a receiver state it expects a type of Thing and know more confidently that Thing will definitely provide the behaviour we need. It’s important to understand that the use of an abstract class is subtly different to the use of traditional interfaces in that an interface doesn’t rely on a concrete implemention. For example, our Thing class is a concrete implementation, and so we can’t provide the receiver with a different class (even if the other class also happened to inherit from Foo) as it won’t be equivalent to a Thing type. Note: the mypy docs have a good detailed breakdown of how to indicate a dependency of a specific class type. That’s it. We’ve looked at how to handle dependencies with Pipenv, and how to utilise static analysis tool mypy along with type hinting to give us more confidence in our code (as well as having the code become clearer intent). Lastly we looked at how to utilise interfaces and abstract classes to help improve the structure and safety of our code. Along with new additions to the asyncio module (a simpler api for a start) and cleaner abstractions such as the new data classes features, the future of Python hasn’t looked brighter.